It was only yesterday that there were rumours flowing around the interweb about a potential gold or champagne coloured iPhone 5S being offered up on September 10th, but it seems Samsung have beaten Apple to the line having announced their own golden Android device. Samsung is already set to beat Apple to the punch by announcing it’s Galaxy Gear smartwatch ahead of Apple’s long rumoured and awaited IWatch – which is not set to unveil until next year. 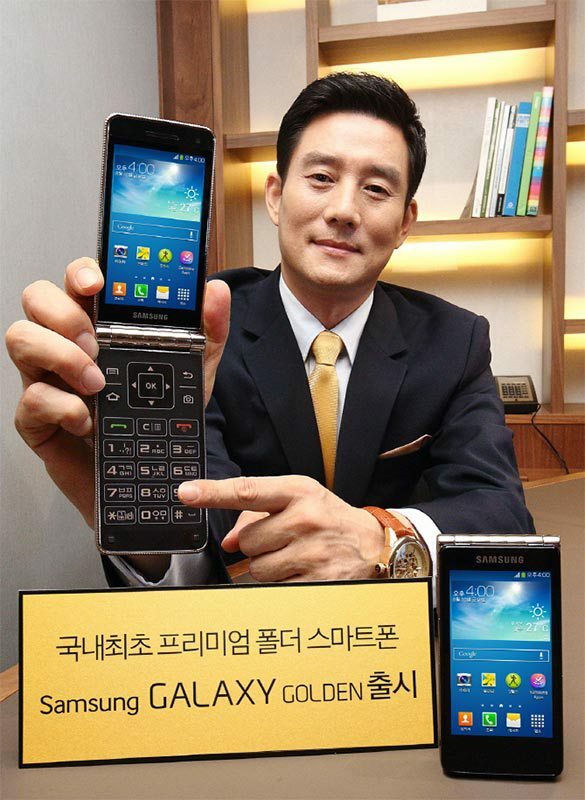 On top of this, Samsung unveiled the Galaxy Golden on Wednesday – an Android flip phone that features two 3.7-inch AMOLED displays with WVGA resolution. Other specs include a 1.7GHz dual-core processor, an 8-megapixel rear camera, a 1.9-megapixel front-facing camera, LTE support, a 1,820 mAh battery and the Android 4.2 Jelly Bean operating system. Funnily enough it also ships in a champagne gold colour, which is coincidentally similar to what has been rumoured about the iPhone 5S, due in September. The launch seems to be limited to South Korea at the moment, with no release details appearing to hint at a global launch. Samsung has a history of (allegedly) copying Apple’s offerings, and they appear to be taking it one step further with predicting Apple’s movements by monitoring the rumours and beating Apple to their own plans. Of course, this could all be a coincidence and Samsung could have always intended on offering the Galaxy Golden in it’s product roadmap way before the golden iPhone 5S was even mentioned – You can be the judge of that. That aside, the Galaxy Golden isn’t a particularly attractive or powerful phone and already ships with an outdated Operating System. Will you be heading to South Korea to pick one of these up to show your friends who are boasting about their Golden iPhone 5S? No, didn’t think so!